Time difference GMT + 5.5 hrs. Tropical with average annual rainfall varying from about 37" to 228". South West quarter and Central Region (approx.1/3 of the Island) receives average 79" with a highest range between 158" to 228" being restricted to Western slopes of the Central Hills and North Eastern Hill Country. A little less than 2/3rd of Sri Lanka receives less than 79". The lowest average rainfall is less than 40" is confined to the extreme North Western and South East Region of Sri Lanka. 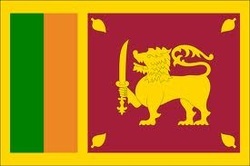 The Sri Lanka Government is committed to building a strong national economy within a market friendly framework. The principal engine of growth in Sri Lanka is the private sector. Foreign Exchange liberalization measures will continue and be improved; private foreign investment both direct and portfolio are strongly encouraged through the provision of appropriate incentives. The scope of the private sector in Sri Lanka is being expanded by encouraging and providing it with the required facilities. New areas of production in agriculture, industry, infrastructure development and the services sector are being promoted. Sri Lanka has a lively stock exchange. Many areas of the economy of Sri Lanka have been identified and privatised with the view to enhance productivity and further expansion. Sri Lanka used the British emblem when it was a British Crown Colony and this continued after gaining independence in 1948. According to the recommendation of a select committee appointed to devise a state emblem more suitable for Sri Lanka (Ceylon) we opted for a new state emblem. It had a lion with sword in its right fore paw encircled with a 'Palapethi' design atop. Below there was a strip carrying the country's name in Sinhala, Tamil and English. A new Republican emblem was chosen after Sri Lanka was declared a Republic on May 22nd, 1972. 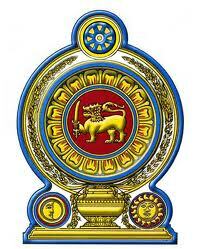 In addition to the lion with sword and the 'Palapethi' design it portrays the punkalasa, dhammachakka, sun, moon and two sheaves of paddy. Nil Mahanel flower was declared the National Flower of Sri Lanka on February 26, 1986. Its botanical name is 'Nympheae Stelleta and grows in shallow waters is found in all parts of the country. ' 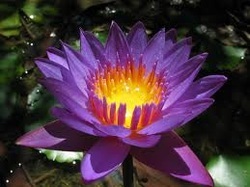 The flower which is purplish blue in colour has a heavy concentration of petals in the center. The Nil Mahanel flower is also considered a symbol of truth, purity and discipline.This flower is mentioned in many Sinhala, Pali and Sanskrit literary works. This flower which is also referred to as "Kuvalaya", "indheewara", "Niluppala", "Nilothpala" and "Nilupul" occupies a pre eminent position in Buddhist literature too. It is said the 'Nil Mahanel Flower' was among the 108 ceremonial designs found on the footprint of Prince Siddhartha. It is believed that the damsels depicted in Sigiriya Frescoes also carry the Nil Mahanel flower in their hands. Traditional poetry known as "Sandesa Kavya" likens women's eyes to the Nil Mahanel flower which has also been used as an ear ornament. The executive branch consists of the President and a Cabinet of Ministers headed by the President. The President who is elected directly by the people for a six-year term is Head of the State and Head of Government. The Prime Minister is appointed by the President from among the Members of Parliament. The legislature - parliament consists of 225 representatives (from whom Ministers are appointed by the President). The Members of Parliament are elected for 6 year terms at periodical General Elections through a system of proportional representation. The Sri Lankan Parliament is a Unicameral (one chamber) assembly.